Eliminate significant health concerns, unsightly stains and unpleasant odors caused by bacteria, germs, viruses and fungus with confidence. Simple Green d Pro 3 One-Step Germicidal Cleaner and Deodorant is an EPA-registered formula made up of highly active ingredients which ensure superior performance. It kills a broad spectrum of health hazards including HIV-1 (AIDS virus), Escherichia coli (E. coli), Influenza A/Texas Virus (Influenza), Staphylococcus aureus (Staph), Staphylococcus aureus-Methicillin-Resistant (MRSA) and Trichophyton mentagrophytes (Athlete's Foot Fungus). It cleans, disinfects and deodorizes in one easy step. Ideal for bathrooms, kitchens, offices, countertops, appliances, desks, doorknobs, telephones, floors, garbage cans and all washable, hard, nonporous surfaces. 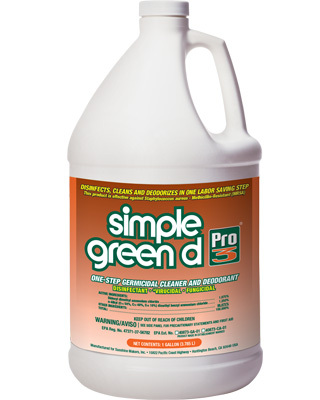 Simple Green d Pro 3 disinfects washable, nonporous surfaces in kitchens, bathrooms, offices and more. Ideal for waiting rooms, cafeterias, clinics, factories, gyms, salons, schools, hotels, prisons, airports and anywhere cleanliness and disinfection are necessary.